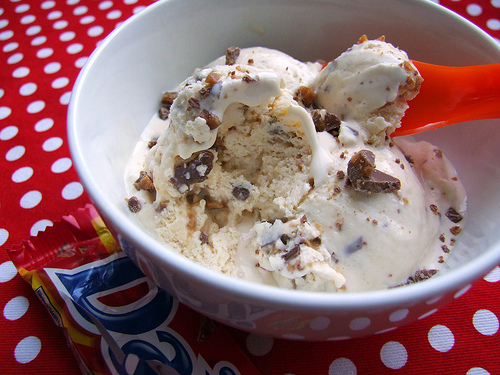 COOL: Daim Bar Ice Cream | Everything is cool. Whisk the eggs and sugar together until light and fluffy (this is easiest in an electric mixer). Heat the cream until almost boiling (watch for little bubbles forming around the sides) then pour the cream over the egg mixture in a thin, steady stream, whisking all the time. Pour the custard into a clean saucepan and heat gently, stirring constantly until it thickens slightly to coat the back of a wooden spoon. It is important to do this gently – if you overheat it, the eggs will start to cook and you’ll get little blobs of egg floating about in the mixture. Decant into a bowl and cover with a piece of greaseproof paper, pushing the paper right down to cover the surface of the custard (this it to stop it forming a skin). When cool, chill for half an hour in the fridge. Pour into an ice cream maker and churn. 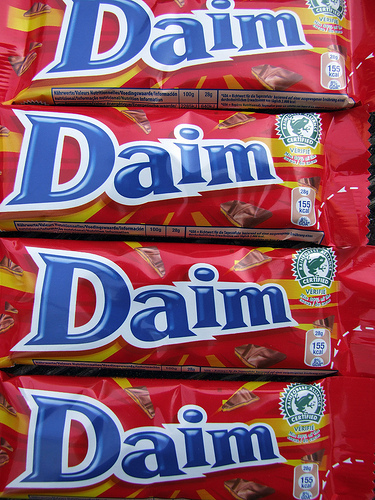 While this is happening, take a rolling pin and bash the (unopened) Daim Bars into pieces. Set some pieces aside for serving and add the rest to the ice cream towards the end of churning.